Performing multiple roles as CEO/Executive Director? A new CEO with no fundraising background? A COO, VP, Board Chair, or a CEO/ED wannabe? Then Executive Fundraising Essentials is for you! You will build your network with those in similar roles. Receive guidance from a mentor. Get the confidence boost and preparation you need to succeed in development. Connect with fellow attendees who are asking many of the same questions, and experiencing similar challenges, as you. 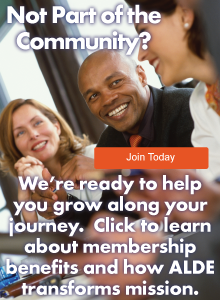 ALDE is known for building a strong community of colleagues who will support you throughout your career. Learn from accomplished presenters who have proven experience in the field. Meet the speakers. "Thank you for organizing Executive Fundraising Essentials! It was well worth my investment of time and money, especially for such an affordable course. I have many notes that I am eager to share with my team so we can get to work on improving our program right away." The Case for Hiring an Advancement Staffer: Fundraisers are not ATMs! Even if you think this isn't for you or someone you know, it is! If you aren't Lutheran, it's OK. Yes, we have Lutheran roots, but we've had non-Lutherans attend, and they were just as pleased. If you aren't working in development right now, it's OK. Essentials courses are great for those exploring the profession. Some early attendees were in job transitions, and others were just starting to consider nonprofit work. If you aren't an ALDE member, it's OK. .
Executive Fundraising Essentials has been approved for 5.75 CFRE CE points. 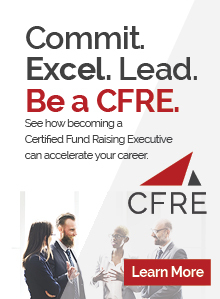 CFRE, or Certified Fund Raising Executive, is the accredited and internationally recognized certification credential for development professionals who have attained and demonstrated a deep understanding of field best practices in ethical fundraising. ALDE is a CFRE Participating Organisation. This partnership means that ALDE stands ready to help you reach your certification or recertification goals. Although the CFRE credential is for professionals with five or more years of fundraising experience, Essentials courses are a great way to get on track to attaining your certification. Just click the graphic, complete the Learn About ALDE form and we'll give you the download link.